Thunderstruck II is one of the most popular slot game these days powered by Microgaming software platform. The game is good because it has 243 paylines and 5 reels. It means you would have higher chances to win big while playing this particular casino slot game at any of the Microgaing online casino sites. You can check this slot game for free as well. Thunderstruck II slot provides a jackpot of 6000 coins and return of the player for the game is 96.75%. You can select coins sizes which range from 0.01 to 0.05. Minimum and maximum coins per line a player could choose starts from 1 to 10. The game is perfect to play wither you are a newbie or a veteran player. Thunderstruck II includes a wild card symbols which is the Thunderstruck Logo, while scatter symbol of this slot game is the Bonus hammer. If a player land on 2 or more scatter symbol on any active reels then he would simply win big amount of money. The option ‘+/-“ can be used to change the coin denomination that ranges from 0.01 to 0.05 per spin, “Coins” can be used to alter the number of coins wagered, “Spin” option can be used when a player need to play the game. Two other options of this game are ‘Bet max” and “Auto Play”. You should use “Bet Max” option if you want to play with its highest wager and should use “Auto Play” button if you want to play the game for a number of times without any interruption. If you land on 3 or more of Bonus Hammer (scatter symbol), you would trigger the Great Hall of Spins Bonus. Players can play 1 of 4 bonus games, but if they want to play 3 bnus games then they will have to trigger the great Hall of free spins bonus games for a specific number of times. Each of the bonus game will award player free spins, which is awesome. There are four kinds of bonus games available in this slot and they are Valkyrie Bonus Game, the Loki Bonus Game, the Odin Bonus Game and the Thor Bonus Game. The Valkyrie Bonus Game will give you 10 Free Spins; the Loki Bonus Game will provide you 15 free spins (and it is activated when players trigger Great Hall of Spins Bonus). Next bonus game known as the Odin Bonus Game is unlocked when the great hall of bonus game is activated 10 times. This bonus feature will offer 20 Free Spins to a player. 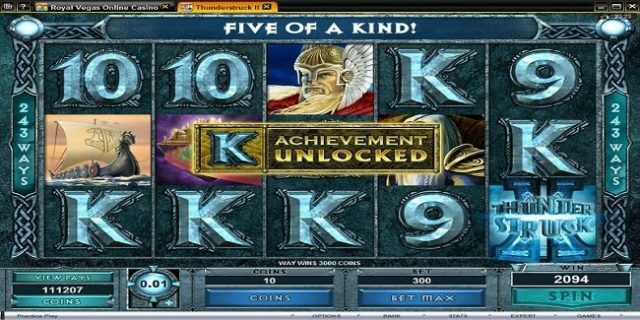 Last bonus feature of Thunderstruck II Slot game is the Thor Bonus game. This bonus feature is unlocked when the great Hall of spins bonus game has been triggered 15 times and then it will reward you 25 free spins.